Arsene Wenger described the penalty Arsenal conceded in Wednesday night's 2-2 draw with Chelsea as "farcical" before declaring his intention to fight a Football Association misconduct charge. The Gunners boss bemoaned the focus on refereeing decisions after a pulsating contest at the Emirates Stadium, although his comments heaped scrutiny on referee Anthony Taylor. Taylor awarded a penalty for a foul by Hector Bellerin on Eden Hazard, who scored from the spot to level at 1-1. Bellerin then equalised in stoppage time after Marcos Alonso had given Chelsea a late lead. Wenger said: "What I find terrible is that we have just seen a great football game and we talk only about things nothing to do with football. "For me it would be nice to at some stage talk about football again." Moments earlier and without being asked about it, Wenger had said of the penalty: "We got again a farcical decision on the penalty, but we knew that as well before (the game). "At the moment we have to face surprising decisions." 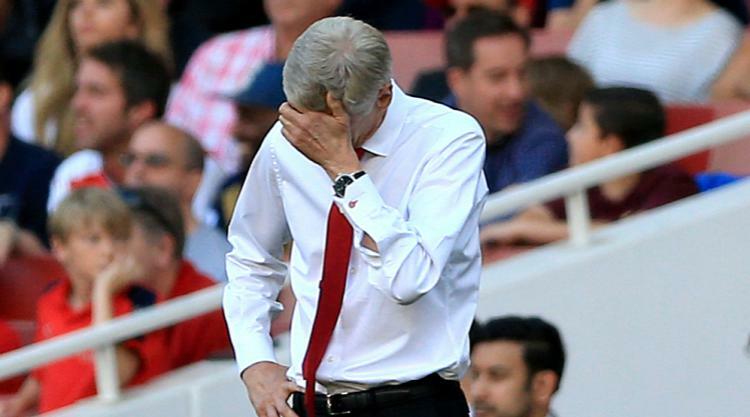 The Arsenal manager also addressed the charge which followed Sunday's game against West Brom. Wenger was furious with referee Mike Dean, who had awarded the Baggies a late penalty at the Hawthorns for a handball by Calum Chambers, and has been charged for his conduct in the officials' changing room. He has until 6pm on Friday to respond, but refutes the charge. Asked if he planned to contest the charge, Wenger said: "100 per cent. You can listen to every interview I said. I stick to everything I said without a problem." Jack Wilshere, who afterwards told Sky Sports there had been "no progress" over his contract which expires at the end of the season, could face retrospective FA action, too. Wilshere had given Arsenal the lead with his first league goal since May 2015, but there were doubts over whether the midfielder should have been on the pitch. Already booked, Wilshere went down looking for a free-kick on the edge of the area and might have received a second yellow card for simulation. Neither Wenger nor Chelsea head coach Antonio Conte saw that incident. Wenger afterwards confirmed Arsenal were near to their first winter transfer window signing, that of Greek defender Konstantinos Mavropanos from Pas Giannina. However, the intention is for the 20-year-old to go out on loan. Conte backed Alvaro Morata after the striker missed two glorious chances, while the Blues were indebted to a Thibaut Courtois save which pushed Alexis Sanchez's shot on to both posts. Conte feels Morata is short of luck and rued the failure to see out victory after Alonso's 84th-minute strike put the visitors ahead. The Blues boss said: "When you are winning 2-1 and there are two minutes to go, I think we have to win the game. "This is not a lucky period for him (Morata). For the striker it's very important to score. If you score, your confidence is up. "In this case your confidence can go down. (But) he's very young. The goal is coming."